Well, now that I finally got to review the original Frosty The Snowman, it was time to check out the sequel. I’m sure that you are aware of how sequels can rarely challenge the original right? This is one of those cases and the plot is definitely not as engaging as the first. It’s still a good Christmas story, but it has less to do with Christmas and more to do with the cold. Frosty has been at the North Pole for a very long time now so he finally decides to head back to town to play with the kids. Little does he know that this upsets Jack Frost! Jack Frost feels left out since nobody plays with him anymore and he decides to put a stop to this effective immediately! He plans to steal Frosty’s hat, which will turn him back into a lifeless creature. Will the kids be able to put a stop to this? This actually sounds like a pretty good plot on the surface, but we quickly find out that the film misses more than a few opportunities. One of the plots that was rather unnecessary was the invention of a Ms Frosty. Frosty got lonely so the kids decided to create a wife for him, but it takes away the uniqueness of Frosty. They also go overboard as they create another guy to also be a Snowman. Also, Frosty no longer needs the hat to survive because he can simply get by on the power of friendship. It’s pretty touching of course, but the hat is why he’s alive and they shouldn’t have changed such a crucial element to his origin. Jack Frost is probably a better villain than Mr. Hickle since he actually has powers, but he also seems to be a little less intimidating than the former. He just wants friends so you can probably tell where that plot will lead as soon as you see him. After all, Frosty’s a very nice guy so I’m sure that he can straighten this fellow out. It’s good to have someone with powers, but he’s probably not the villain that you were looking for. Frosty The Snowman is still a pretty great lead, but his naivety goes into borderline parody mode as he welcomes insults. Jack Frost takes some shots at him, but he doesn’t notice and thanks him. Jack Frost also nearly takes down the whole town with his sudden blizzard, but Frosty and Ms. Frosty decide to invite him for the wedding. He may have been trying to destroy it, but that won’t stop Frosty. Frosty lives up to his name since nothing ever seems to ruffle his feathers. The only time where he drops this front is when he lets the kids know how lonely he is. The animation is about as good as the first one although they decided to switch a lot of the character designs for some reason. It also helps to try and trick the audience at first as Frosty’s eyes are red, but then we quickly learn that he is a fake. The soundtrack is certainly a little more bland and we don’t get the cheery Christmas songs that you may have been looking forward too. Beyond that, there are many nods to the first film like the Police Man who was shocked the first time. I think he shouldn’t have been shocked here so that wasn’t a very believable scene, but it’s good to see him come back I suppose. The narrator still seems to be the wisest character in the series and he’s always ready for the change in seasons. The action scenes are probably more intense than the first film’s although you can barely call them “action” scenes. The film is still pretty fun and enjoyable while you’re watching it, but the Ms. Frosty parts do tend to drag a little. Frosty didn’t need a match and that’s the part that I find a little hard to get over. She’s not a bad character at all. Maybe a little generic, but that’s to be expected. I just would have preferred if she was a childhood friend of Frosty’s or something. Overall, Frosty’s Winter Wonderland is about what you would expect from a sequel. 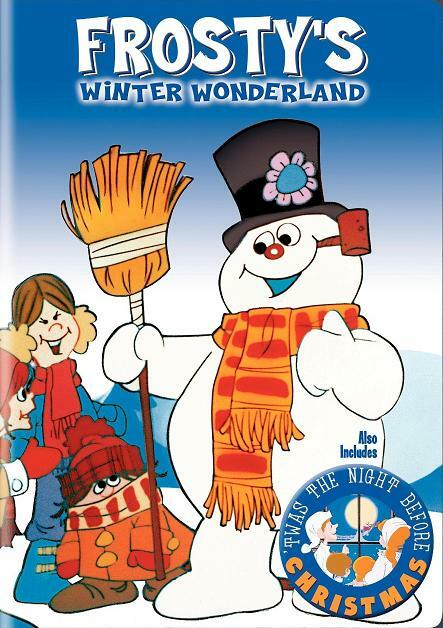 It’s decent and Frosty’s still a pretty good character, but it lacks most of the charm and wit that the first film had. This one is simply a pale shadow from that title and Santa Clause doesn’t even get to appear. The animation is still good enough, but the soundtrack might be a little worse. It’s a bit of a stretch to recommend this film, but it’s very short at around 30 minutes so it can’t hurt that much and you’ll get to see Frosty again. That may be a good enough deal right? This entry was posted in Animated Movie Reviews, Animated Movies, Reviews and tagged Christmas Review, Film Review, Frosty The Snowman, Frosty's Winter Wonderland, Movie Review, Review by dreager1. Bookmark the permalink.